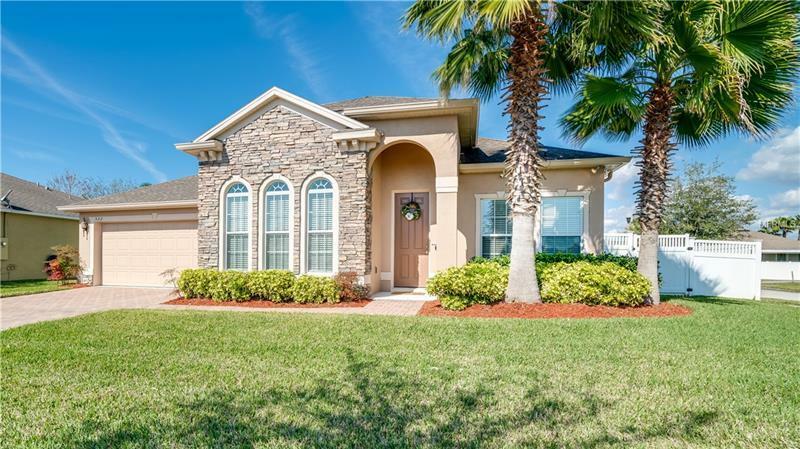 This beautiful home is located with in the coveted golf cart district of downtown Winter Garden. You can be on Plant St. in minutes by golf cart, bike or walking the West Orange Trail. The 3 bedroom, 2 bathroom home was built in 2012 and has all the upgrades offered by the builder and more. The kitchen has beautiful cherry cabinets, granite countertops, upgraded appliances and is open to the eat-in area and family room. Additional cherry cabinets & countertops were added for extra storage. The formal living/den/office can be a quiet place to relax or work by closing the beautiful glass pane doors. The formal dining is perfect for hosting friends and family. The spacious master bedroom was extended to add a seating area. Off the master bathroom is a walk-in closet that was upgraded with a custom design by California Closet. The 2nd and 3rd bedrooms are on the other side of the house along with the 2nd bathroom which has an oversized shower. The extra clean 2 car garage has also been upgraded with California Closet storage. The home sits on a corner lot, has a fenced in back yard and backs up to the West Orange Trail. Copyright © 2019 Mid Florida MLS. All rights reserved. The data relating to real estate for sale on this web site comes in part from the Internet Data Exchange Program of Mid Florida MLS. Information provided is for consumer's personal, non-commercial use and may not be used for any purpose other than to identify prospective properties consumers may be interested in purchasing. JC Penny Realty participates in the MFRMLS Internet Data Exchange (IDX) program, allowing display of other MFRMLS broker's listings on this site. However may not include all listings currently available. Information is deemed reliable but not guaranteed. Information last updated at 2019-04-20 03:51:21.